Composer Andy Teirstein is a 2014-2015 LABA alumnus. His work, inspired by the rich and diverse folk roots of modern culture, has been described by The New York Times and The Village Voice as “magical,” “ingenious,” and “superbly crafted.” A student of Leonard Bernstein, Henry Brant, Bruce Saylor and David Del Tredici, Teirstein writes music for the concert hall, film, theater, and dance. 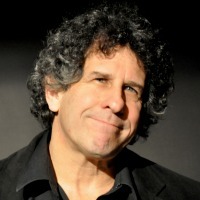 He is the recipient of awards from the National Endowment for the Arts, the New York Foundation for the Arts, and the American Composers Forum, among others. Here, Teirstein presents his ongoing musical project conceptualized to transcend political and religious borders and explore Otherness through cultural and musical collaboration. Is there something implicit in Judaism that urges each Jew to confront Otherness, to see his or her self in the Other? The biblical character Abraham’s prescription to leave his birthplace is echoed in his grandson Jacob. In his journey young Jacob, bereft of home, his head asleep on a rock, dreams of a ladder to heaven. His son Joseph, in turn, also finds himself far from home. There he puts on the mask of Egyptian identity. Is there an essential spirituality that can only be engaged by leaving what we know? The recurring theme is not an inward buttressing of home nationality, but the journey outward. And yet we find in each biblical character a strength of inner identity. Joseph, in his Egyptian power suit, is brought to tears when he receives his brothers, whom he should have every motive to dispossess. And this tension between seeking immersion in the Other and kindling your essential identity is also at the heart of what it means to be an artist. A few years ago, while New York University was positioning itself as a premiere global institution consisting of numerous thriving international study centers, an administrative team came to each department to ask faculty for input on “how to energize our global sites.” I found the question compelling, and responded with a paragraph. My concept was simple: create an institute in Israel that would look at how dance and music function at borders of cultural difference. I was thinking of the numerous communal threads you can find in Israel, each with its own history – East European, Moroccan, Iraqi, Eritrean, and of course Palestinian, to name a few. In proximity, they affect one another and yet remain distinct. This institute, in turn, might be a model for global sites in Ghana, France, Abu Dhabi and other places, each with its own storied cultural juxtapositions. Two years later the NYU administration came back to me – they would fund the proposal on a global scale as a three-year working group. I gathered a group of professors across disciplines – Dance, Music, Anthropology, Performance Studies – and we named it Translucent Borders. We are now midway through the journey. Our research has brought us to Israel and Palestinian Territories, to the Greek island of Lesbos (the first landing place in the European Union for thousands of fleeing migrants), to Ghana and Cuba. The concept of multiplicity is at the core of the Translucent Borders endeavor. The elements we engage with are all species of encounter–between cultures, genres, styles, media, instrumentation, religion and gender. It may be that artists are uniquely qualified to move, ghostlike, across lines. Dancers and musicians are trained to observe, listen, and to collaborate. Perhaps, through the trick of non-verbal communication, we have the ability to become skilled navigators of zones of conflict, listening at the blockades. It shouldn’t come as a surprise that people are eager to share their arts across borders. You may call it naiive, but the simple human tendency persists: we’re fascinated with people who are different from us. And more than that, we are especially wired to exult in finding points of confluence with the stranger. In our Translucent Borders expeditions, we are trusting in a set of keys that open locked gates, perhaps beginning with a violin, a drum, and a few dance steps. We are also bringing a camera, creating a film record of interviews, jam sessions, and song and dance swaps. People seem eager to tell us their stories. A Ghanaian dancer told us that his father, a master drummer, was buried inside of a drum. I noticed that the concrete tomb had two handles welded onto it. He explained that several times a year they lift the cover to open the tomb, rearrange his father’s bones in different dancing poses, and sing and dance with him all night. There are challenges, mostly about the layers of preconception we bring with us. 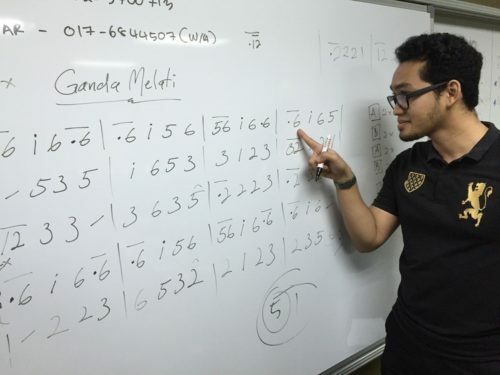 A few years ago I was invited to Malaysia to teach a ten-day workshop on music composition at the Aswara Academy of Music and Dance. When I first arrived in Kuala Lumpur, I saw everything through a veil woven from the romantic sea tales of Melville and Conrad, the exotic jungle island paintings of Rousseau, and a noxious, scalding fog of phobias (xeno and Islamo), a shadow on some level of my consciousness. Seeing women in hijab head-coverings sitting at a restaurant table on the street, bringing food to their lips with their hands, I wanted to draw my phone from my pocket to take a picture. But one of them looked over at me; we made eye contact, and I walked on, perhaps one degree more present, a guest here. On the first morning at the Aswara Academy, I went around the room by way of introduction, and to assess the musical caliber of the class. There were practitioners of different genres of the Malaysian performing arts spectrum, most of whom could not read music — experts in shadow puppetry, folk theater, and gamelan, representing a variety of Malaysia’s many ethnic traditions. I tried to orient myself in this landscape marked by cultural compass points. I drew a music staff on the board; spoke of duple and triple meter, piano and forte, the power of tempo change, vertical and horizontal sound. I smiled and they smiled back. But by the end of the day the reality was hitting me: I was losing them. They watched politely, taking in the translation, but they were increasingly adrift. That evening, in my room, I was beginning to panic. How could I sustain a workshop of ten six-hour sessions in this environment? What, if anything, could I offer this group? On the second afternoon, I was approached by an older gentleman, an ethnomusicologist named Mustapha Nik Mohd Salleh, who spoke softly and with such broken English that I could barely follow his thoughts. He was holding a wrinkled paper in his hand, and reading choice lines to me with a gleaming eye. I began to catch phrases; he spoke of the influence of different cultures that, in juxtaposition, can act as a creative catalyst. Professor Mustapha was indicating to me that this was an important concept that I had to bring to the students. Sometimes it takes a little old man to turn a table. The next day we started again around the circle, but this time I asked each participant about his or her own work. I spent the day listening to them describe their musical practices, and enjoyed their proud demonstrations of their instruments. In this way, we moved from the posturing of words into a purely musical conversation. I was introduced to mayoun singing, to the ringing of caklempong (a set of gongs), the bowed rebab (a kind of fiddle), and the sape (plucked stringed instrument). In exchange, I showed them the old-time banjo clawhammer style, the Appalachian-tuned fiddle, and the jaw harp. I found that the Malaysian system of using a series of numbers to denote pentatonic tunes was easily transferable to the banjo. And little by little, we began to weave our music together toward a culminating performance. Toward the end of my time with these remarkable artists, on a lunch break, I felt a tugging on my jacket. It was old Mustapha. What was he whispering? I was aware of the fact that Jewish music is, by Malaysian law, prohibited. In 1983 Leonard Bernstein cancelled a Malaysian tour because they would not allow him to include Ernst Bloch’s cello concerto, “Shelomo.” I asked Mustapha, “but is it allowed?” He dismissed the question with a brusque wave of his hand. And indeed, there was a palpable interest in the Jewish songs and chants I shared with them. I sent a melodic line out into the room, and it developed over a half hour into an elaborate Malaysian and Jewish Havdalah candle of braided song. The last two days were spent choosing from our growing repertoire of pieces, and rehearsing them for performance. 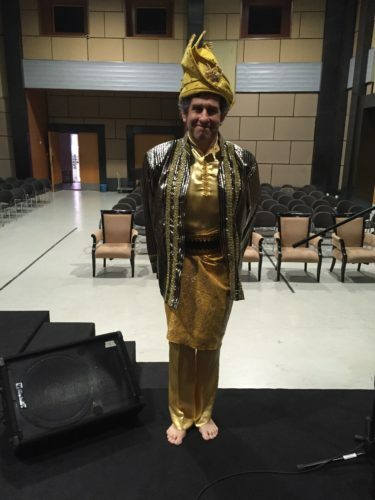 When I came at last to the theater for the sound check, I was led off to a room and dressed in a glittering traditional Malaysian costume, which was complicated to get into, with various belts and robes intertwined and folded in specific ways. Best of all was the spiraling headdress that resembled a golden-dipped ice cream cone. Maybe it was the effect of this costume, placing me amidst the other traditionally-garbed musicians and dancers on stage, but throughout the performance I was imbued with a sense of wonder. 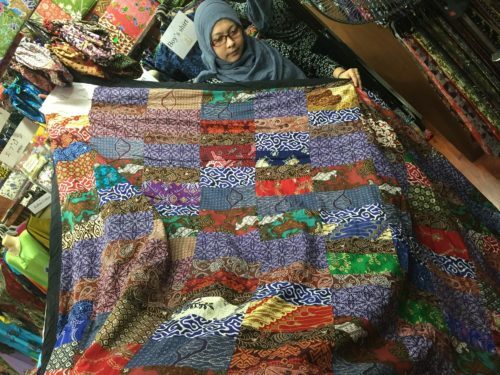 As a primer in the process of cultural encounter, my ten days in Kuala Lumpur gave me some clues. The gist is so elementary that every child knows it: We want to find the Other, and to play the game of show and tell in our shared language of music and movement. When this happens, the art may change in ways we can’t predict. Something is lightly touched in the DNA of our cultural identities — a place, ever changing, we can never really know.